I had seen Eraserhead a couple times before and always liked it, even if I had found it a bit of a struggle to sit through. 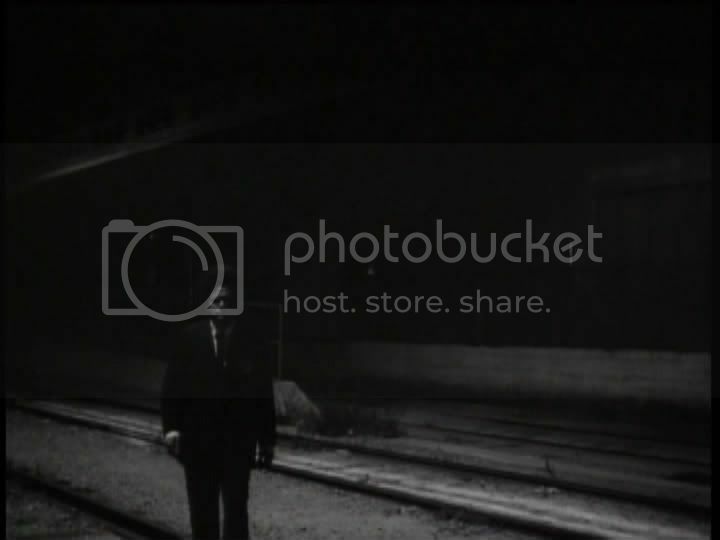 Because of this, it was a tremendous experience falling truly in love with Eraserhead for the first time. I was utterly engrossed in the world David Lynch created for Henry (Jack Nance), and as soon as it was over I wanted to watch it again to observe more closely the details, the nuances, and the incredible mise-en-scène of the film. 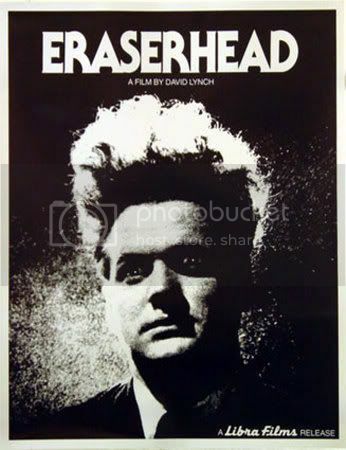 Eraserhead was the project that initially brought Lynch to the public eye. Meticulously worked on for five years, he crafted it piece by piece with the utmost care. When it finally saw the light of day it became one of the most popular films on the underground circuit, playing constant midnight screenings around the country. It caught the eye of Mel Brooks, who tracked Lynch down to direct his next production, The Elephant Man. The film itself is a masterpiece of craftsmanship. The setting is foreboding and industrial, with the only living trees being the small one that grows on Henry’s bedside table. The exteriors perfectly capture the feeling of living in a steel and concrete jungle. There are constant rumblings and bangings, suggesting that Henry is surrounded by factories on all sides. Yet he runs across precious few other people. I probably ought to provide a brief synopsis of the plot, though it may be unnecessary and distracting. Our hero is Henry, a bit of an awkward man with awkward hair. He has a sweetheart, Mary X (Charlotte Stewart), who invites him to dinner one night. She has an ulterior motive, as her mother (Jeann Bates), informs Henry. Mary has given birth, you see, to a child of sorts. It has not been a full nine month gestation, however, and they are not even sure it is a child. Henry, being respectable, marries Mary and she and the child move into his one room apartment. He resides there, in one room, with a bathroom and a dresser on which the child lies. There is a cupboard on the wall, in which he stores a chili pepper. There is the aforementioned bedside table, on which he stores a tree. There is also a radiator, in which someone very important lives and performs. This may sound weird, but it is not weird for the sake of being weird. Everything in the film serves to enhance the atmosphere, the mood, with which Lynch is so concerned. Even the way the actors move, slowly and oddly, is deliberate. There is a constant sense of unease throughout the entire film. 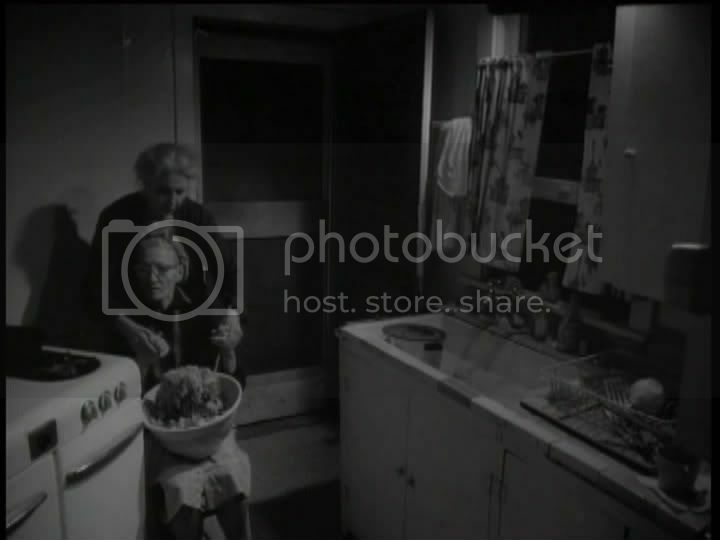 Certain things look normal, like the grandmother (Jean Lange) smoking in the kitchen. But there is something odd here, as the mother moves the grandmother’s arms to toss the salad. The film is a bit abstract, to be sure. Because of this some people might not appreciate it. From a narrative point of view it doesn’t necessarily “make sense.” Keep in mind that sense-making is not the point. Lynch has created a mood, a feeling, that permeates the film. There are moments of pure horror, but not in any conventional sense. There are themes present that are supported by the mood and the atmosphere. I would attempt to elaborate, but I would most likely be wrong. Every viewer should interpret it for him- or herself. 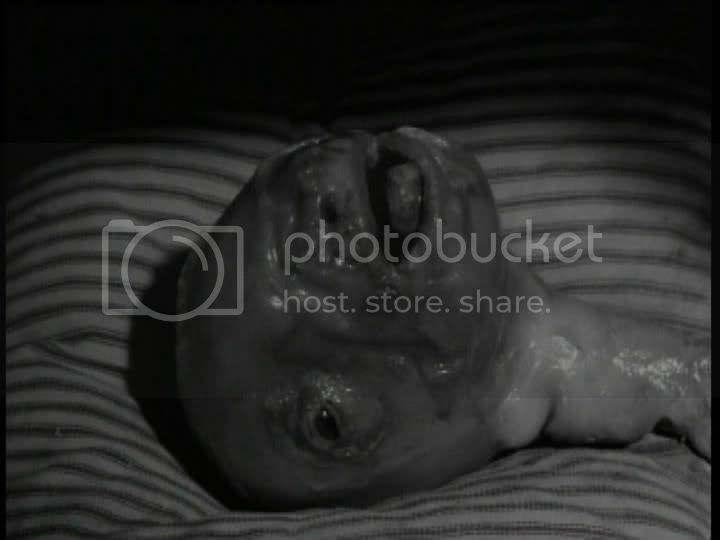 Eraserhead is a fantastic experience. It is a film unlike almost all others, made with a degree of technical expertise rarely attained in cinema. The directing is superb, the art direction and lighting simply mind-blowing. Each actor fulfills his or her role perfectly, melding into the scenery marvelously. They feel as though they belong in this unnatural world. Eraserhead is a film to be watched quietly, on a large screen, with the sound turned up. Give yourself a chance to be fully immersed in Lynch’s universe, with few distractions. The film hardly runs over 80 minutes so the experience is condensed and satisfying. I hope I get the chance to watch it again soon. This entry was posted in 3.5 pirate flags, 4 stars, E, Movie Reviews, Movies I Truly Love, Star Rating on January 6, 2010 by Tim Irwin.